A visit to either of our two nurseries is an unforgettable experience. Come immerse yourself in a variety of striking display gardens, explore our unmatched selection of plants, shrubs and trees, all while surrounded by the sights and sounds of fountains, chimes and whimsical garden art. 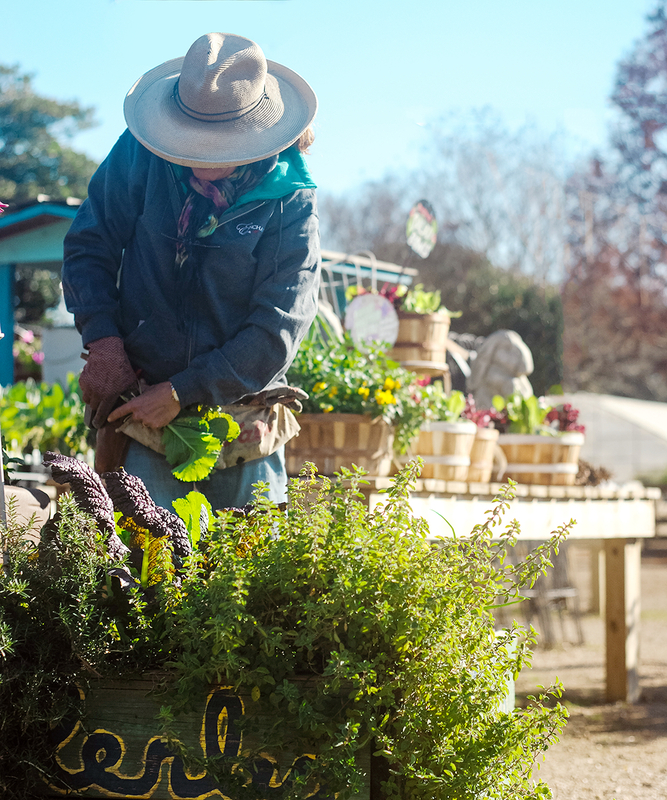 Fresh herbs and vegetables, antique and hybrid roses, and native Gulf Coast plants; these are just a few of the things we’re passionate about here at Enchanted Nurseries and we’re eager to help our customers discover their own gardening passions. Our helpful team is as enthusiastic as they come and they’re always ready to lend a helping hand or a listening ear. Enchanted Nurseries is a family endeavor and we strive everyday to create an environment that inspires, educates, and strengthens our bond with nature. Picture above is a comprehensive view at Enchanted Gardens during December including annuals (foreground), perennials (distant background), vegetables (center), custom planters (center), statuary (center), and kitchen-top compost containers (far right). Enchanted Nurseries has qualified Arborists, Master Gardeners, Texas Certified Nursery Professionals, and Texas Certified Water Smart Professionals on staff. Lauren, our vegetable and herb expert at Enchanted Gardens, attends to our resident raised bed. We use these plants for community Friday lunch as well as to show customers how the plants we sell look when established. Our Enchanted Pets sign at Enchanted Gardens (featured in Green Profit Magazine) cleverly teaches customers about our pets’ individual personalities and how to best approach each one. It’s great at keeping the kiddos busy trying to locate all the animals while the parents do some serious shopping! Great soil is the foundation for all great gardens. Enchanted Nurseries carry only the most cost-effective and environmentally conscious soils and soil amendments available. Visit either location to speak to our well-versed staff and read our informational signage so you can make an informed decision that will hopefully become easy routine garden prep every year. You’ll find a well curated selection of composts, soils, and soil amendments that have been selected for their beneficial organic ingredients, long-standing respected reputation, and creative sourcing of ingredients. Although it’s fairly nutritious, Texas’ clay soil can be hard to work in and it holds water like a bath tub. Add compost or expanded shale to improve soil drainage and mulch for fewer weeds and better moisture retention. You’ll be well on your way to creating a hardy footing for your garden. Shown above is our bulk area at Enchanted Gardens, marked with a hard-to-miss sign towering above the hardwood mulch. Our bulk soil mixed on site; it’s an organic mixture of good dirt, compost, fertilizer, and expanded shale. We like to carry a variety of organic, and partially organic soil amendments and fertilizers. Ask our knowledgeable staff before purchasing to make sure you have what you need. Just like us, plants need proper nutrition to grow and thrive. We carry only what we consider to be a tried and true selection of fertilizers to meet the needs of your landscape and plant health. Let our experts direct you in choosing the proper fertilizers that are both cost effective as well as simple to use. Our recommendations include organic as well as partially organic solutions. Like our soils, you’ll find a well curated selection of composts in liquid concentrates, granular form, and ready-to-use sprays. Once you’ve got your garden planted, adding those personal, finishing touches is always rewarding. Our uncommon assortment of garden accents ranges from whimsical to classical and from fun to functional with something for just about everyone. We feature statuary, fountains, benches, wrought iron, and many other unique pieces of garden art that will add that little something extra to your outdoor space. Pictured above are two styles of hand-made Talavera Mexican pottery displayed together at Enchanted Gardens. Our buying staff hand-picks the Talavera out of a wide selection with our customers and local culture in mind. They look for familiar signatures of our favorite artists as well as keep an eye out for new gems. Picture above is a stone pot and pedestal at Enchanted Forest planted with cool season annuals—sweet alyssum and pansies—with a lemon cyprus as the centerpiece. Find bold color at every level of this custom container! No matter what you enjoy planting—veggies, herbs, flowers, shrubs or trees—you can plant some version of it in a container. Colorful hanging baskets, planters and window boxes add impact, soften edges of patios and pool decks, and direct traffic in outdoor areas. We are here to help you! Our in-house container designers are creative and experienced at creating beautifully layered and seasonally appropriate containers. They’re experienced with the plants of each season and how they mature. With that knowledge, they create long-lasting and healthy arrangements to beautify our nursery until a customer takes them home. Bring in your pots or hanging baskets to either location to have our experts create a custom design to meet your specifications. Each order should be placed in advance—turn-around time varies depending on the project queue and the season.